Macron, now considered the favorite to win the French presidency, celebrating his victory on Sunday. The results of the first round of France’s presidential election are in: Centrist independent Emmanuel Macron and far-right populist Marine Le Pen are the two candidates who will advance to the final runoff election on May 7. This outcome is historic in that neither candidate is backed by a major French political party, and also historic in that it pits two diametrically opposed world views against one another. French voters will have a stark choice in a few weeks, between Macron, a socially liberal globalist technocrat who favors integration with the EU, and Le Pen, a far-right nationalist who is anti-immigration, anti-EU, and anti-Islam, and is positioning herself as a populist champion of the aggrieved working class. The new battle lines are already being drawn in France as many Establishment political forces — including the leaders of the two major political parties that were soundly dismissed at the polls on Sunday — are quickly aligning behind Macron in opposition to Le Pen and her National Front party. Macron, based on current polls, is expected to win the runoff on May 7, but there are still tectonic political forces in play across the country and region. Below is a roundup of some of the first reactions that pundits and analysts on both sides of the Atlantic have had to Sunday’s results and the potentially Europe-shifting election yet to come. As Mr Macron and Ms Le Pen now prepare for a tough two-week campaign, France could be in for a deep political realignment. Disappointed centre-left deputies from the Socialist camp, whose candidate, Benoît Hamon, secured a miserable 6.2% of the vote and who fear for their parliamentary seats, could well knock on Mr Macron’s door ahead of legislative elections in June. The En Marche! team says that many Socialists are ready to defect. On the right, the Republicans had expected this election to belong to them, after five years under the unpopular Mr Hollande. Some of its deputies too will be tempted to join Mr Macron. Dominique de Villepin, a former prime minister (though not a deputy), has already pledged his support. Within the party, there will be recriminations and despondency as it decides how to pick itself up, and whether it can survive in its current form. On May 7th, France faces a choice that will determine not only its future but that of the EU. It will become the most crucial test case in Europe for whether a liberal Western democracy can defy the trend and face down nationalist populism. The political alternatives on offer in this run-off could scarcely differ more. But the chances are that France’s next president will be a man with a dream and a gamble, who is now as well-placed as possible to become the next, and youngest-ever, president of the Fifth Republic. Mr Macron is the best hope of a deeply troubled but great country. Its problems range from inequality to unemployment, social divisions, terrorism, and a ruling elite with a strong sense of entitlement. Mr Macron comes from that class, is untested in many ways, is mistrusted on the left, and therefore needs to earn the voters’ trust afresh. He has been lucky in his rivals, on the left and on the right, and he was the first choice of only 23.7% of the voters. But he has been rewarded for the great political audacity of his centrist challenge to the ancien régime. Electing him in May is now the only way to open up the chance of progressive, liberal and pro-European reform in France. French voters have made a bold break with the past. Now they must finish the revolution. If Macron does, as polls predict, win the second round, it will undoubtedly be painted as a rejection of populism. But as my colleague Uri Friedman wrote in the aftermath of the Dutch elections, where a far-right candidate performed worse than expected, “the most significant trend in Western democracies at the moment might not be the rise and fall of populist nationalism. Instead, it is arguably the disintegration of political parties. The story here is less about which specific type of politician people want to be represented by than about a crisis of democratic representation altogether—less about the empowerment of populists than about the broader diffusion of political power.” Indeed, the exit polls in the French election show a similar dynamic at work. Looking at elections in all European countries since 1990, I and a co-author found that when the line between the center right and the far right blurs, the centrists inadvertently give more credence to ideas that were once considered too extreme. As those ideas enter the mainstream, voters who once found the far-right agenda unsavory, may start to think otherwise. (After all, if establishment leaders are saying it, it must be acceptable). Over time, the adaptation strategy only emboldens the far right. For center-left parties, the rise of the far right and the strategic fumbling of the center right, could be an opportunity to win back their constituencies. For center-right parties, the challenge from the far right is a chance to recalibrate their policy agenda around core principles of fostering economic growth and stability within a strong Europe. One candidate in the French race offers a reason for hope. Macron, the center-left independent, is running a campaign rooted in pro-European principles, liberal democratic values, and an open economy. Although he has certainly benefited from Fillon’s scandal-plagued candidacy, Macron is popular because he is not seen as a politician or technocrat but as a new face emerging from outside the political establishment. 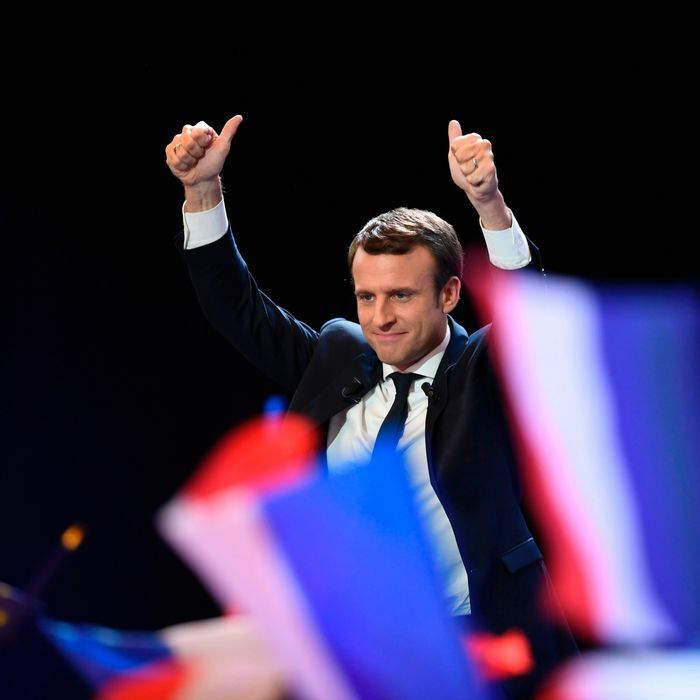 … Indeed, Macron’s traction as a pro-European candidate signals that frustrated voters are drawn to new ideas, new faces, and a positive narrative, even if that agenda is a repackaging of old pro-EU policies. The center right across the world should not give in to the far right, and the center left must stand firm on progressive principles that channel voters’ anxieties rather than feed them. Despite the challenges he faces, Macron’s win also shows that voters can turn against the establishment without embracing the extremes, either on the right or the left. On the campaign trail, Macron rejected traditional political classifications. With the establishment parties discredited and populists of all persuasions increasingly indistinguishable in terms of their policy agenda, it’s easy to see why he sought to distance himself from those categories. If Macron succeeds with his call to “to relaunch the construction of Europe,” look for other European candidates to adopt his post-ideological, pragmatic message. Manufacturing jobs figure pretty big in this election. De-industrialization has been a key theme for Le Pen. She campaigned in the French Rust Belt, the northeast part of France near Germany, and also places across the north where factories have been shuttered one after another for lack of global competitiveness. Workers there whom I’ve spoken with say she gets it. She’s calling for “intelligent protectionism” to reverse that, and promises to reverse de-industrialization. Though it is far from clear that her policies to “protect” France by pulling it away from Europe would achieve that. In the coming duel, voters will be divided between the haves and have nots. Macron’s followers are entrepreneur types. Those who will vote Le Pen are those struggling with unstable jobs or to find work, and they don’t see themselves in Macron’s mold. I recently visited Calais, a town that has been ravaged by deindustrialization. None of the workers said they felt he understood them, although executives said they would vote for him if Fillon didn’t make it. For Le Pen, there has been no Trump effect, but rather a Wilders effect: the far-right hasn’t done as well as expected. Le Pen has often complained that opinion polls are inaccurate and misrepresent her score, but not in the way she thought. And suggestions that she might even get as high as 30% (Russian opinion polls?) have proved to be utterly unfounded. While the 23rd April 2017 will go down as a historic moment for the French far-right, for Le Pen and within the [National Front], it’s a disappointment. She wanted to go into the second round in pole position, using that as her platform to denounce ‘the system’ for preventing the ‘real’ voice of the people from being heard, even though she knew that she had little chance of beating either Macron or the right-wing candidate, Francois Fillon. Instead she has herself only seen off Fillon by 2%. [W]hile there were plenty of precedents for a polling error large enough to elect Trump, there aren’t all that many examples of a 26-point polling error, which is what Le Pen would need. Pundits and other political observers often have poor intuition when it comes to translating polls into probabilities, leading them to treat narrow, fragile leads the same as double-digit ones. Ironically, the same type of sloppy thinking that led people to underestimate the chances for the Trump and Brexit victories may lead them to overestimate Le Pen’s odds. If Le Pen if can significantly narrow her deficit with Macron over the next two weeks, Macron’s supporters will have reason to worry. If she still trails by something like 26 points on election day, however, a Le Pen victory would be essentially unprecedented. She could beat her polls by as much as Trump and Brexit combined and still lose to Macron by almost 20 points. However well-intentioned and authentic the likes of Macron and Co., who probably grasp how truly bad it can get in Europe, their ilk are still locked into policies guaranteed to further aggravate political extremism left, right, and Islamic. They think their political stalemate with Le Pen and her fellow travelers is a victory. Really, it spells a fiercer culture war. Le Pen is both culturally and economically protectionist. This is why she is not Far Right and can more properly be described as a national socialist. Macron, by contrast, is both economically and socially liberal, a global free trader utterly unfazed by, say, gender fluidity. Le Pen often talks of the clash of civilisations. She means between the Judeo-Christian West and Islam. But the clash of civilisation now at play in the French election is actually between these new undiluted configurations of protectionism and liberalism - what Tony Blair would call “closed” and “open” Back in Britain, David Goodhart has defined this new political schism as that between the politics of somewhere and nowhere. It certainly had an impact in Brexit, but the big difference was that the triumphant Brexiteer camp contained within it elements of both globalist and localist. Not so in the French election. There we will now see these two visions of the future of the West – Macron’s economically and culturally liberal, versus Le Pen’s economically and culturally protectionist – in two camps on the electoral battlefield, facing off for the first time. It will certainly not be the last, in France or elsewhere.